Denali National Park, Alaska. Maps at bottom of post. Actually, it was a day and a half, but that doesn’t make as good of a title. 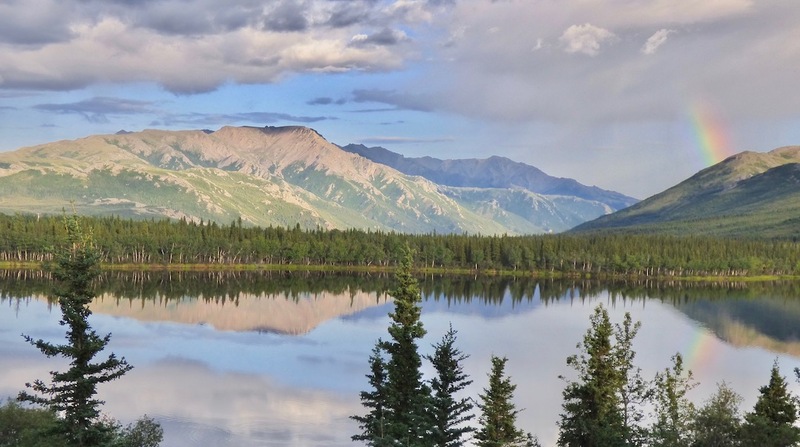 Why would someone spend only a day and a half at Denali National Park? Because that’s all the time we had. 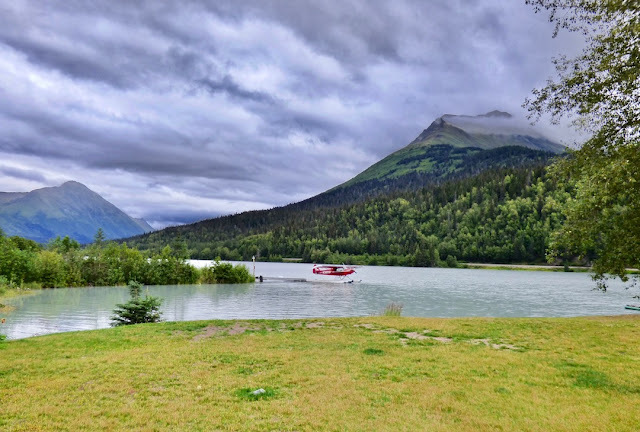 In August 2014, my sister Andrea and I visited Kenai Fjords National Park (see the links along the right for the trip report), and after our itinerary there, we had three days before our flight back home out of Anchorage. 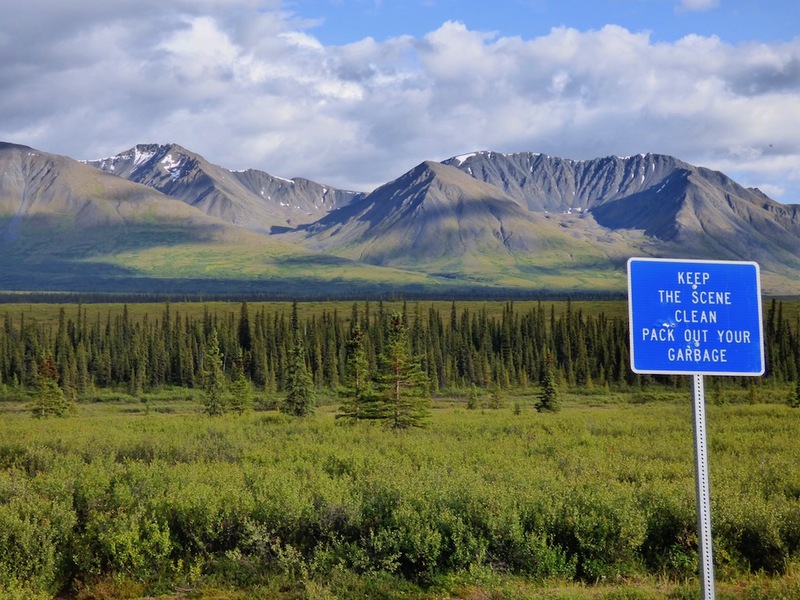 It’s possible to drive to Denali from Kenai Fjords in one day, provided one doesn’t mind a long drive chock full of spectacular scenery. 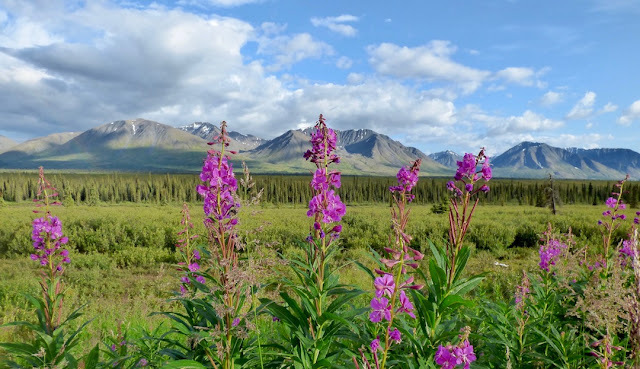 We decided to drive from Seward—our home base at Kenai Fjords—to Denali on Day One, spend Day Two in the park, then drive to Anchorage on Day Three. The scenic drive is spectacular, and as far as ways to spend a few days are concerned, this wasn’t too shabby. 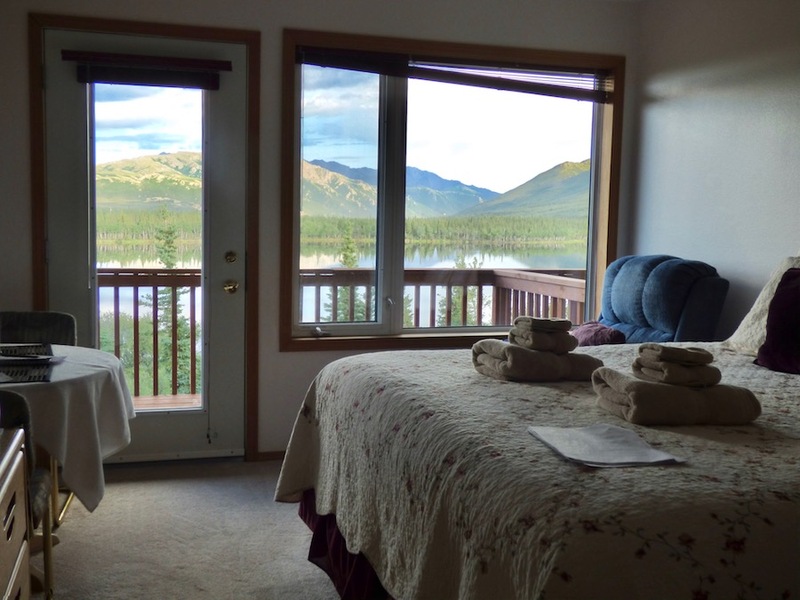 Would we have loved to spend a week in Denali? Of course! But if the options were 1) Spend one day at DNP, or 2) Don’t go to DNP at all, we were going to go with option #1. 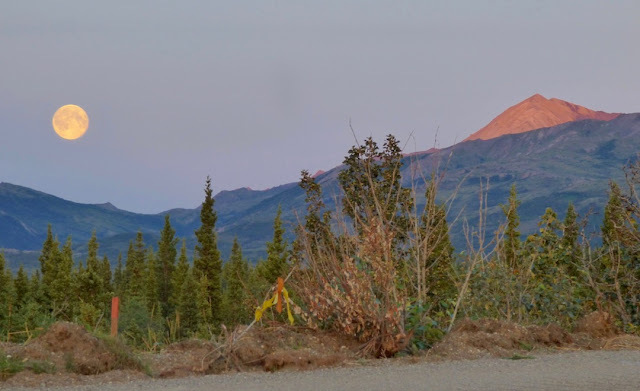 There was a part of us that wanted to get to Denali as early as possible and maybe squeeze in a short hike and check out a visitor center before nightfall. But in the end we decided not to rush the drive. The journey should be the adventure, and we let the day unfold on its own. The drive was approximately 375 miles; we took our time, stopped whenever and wherever we wanted, and had a spectacular time. It ended up taking us forever to get there, but it was worth every minute. We said goodbye to the wonderful town of Seward, and headed north around 9:00 am. After seven days on the Kenai Peninsula, we were finally going to experience what something other than rain was like. Every single day of our Kenai Fjords adventure was enjoyable, but we were excited at the prospect of dry clothes and maybe even some sunshine. Our first stop was Moose Pass, which is a town of around 120 people. We spent a few minutes enjoying the view along Upper Trail Lake, took a clandestine photo of an Alaska State Trooper vehicle, and moved on. Next was Girdwood, southeast of Anchorage. 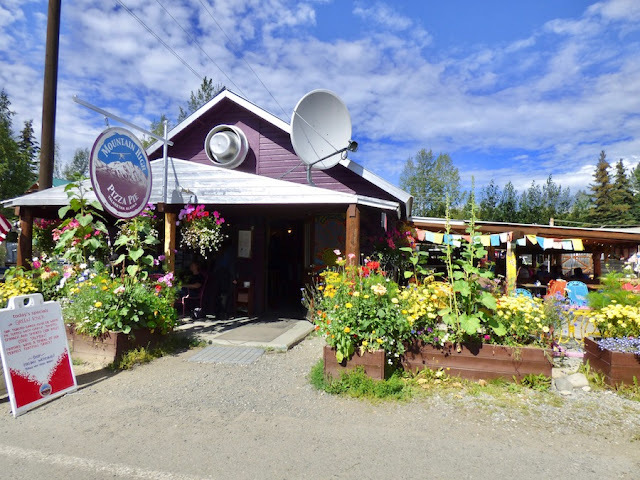 We visited the Alaska Roots store for a few screen-printed hoodies, and chatted with the young couple who owns the store. We each picked out a few designs we liked, and watched the owners’ adorable baby crawl around the front of the shop while our sweatshirts were customized in the adjacent workroom. After that we wandered around the small town and checked out a few other shops before moving on. 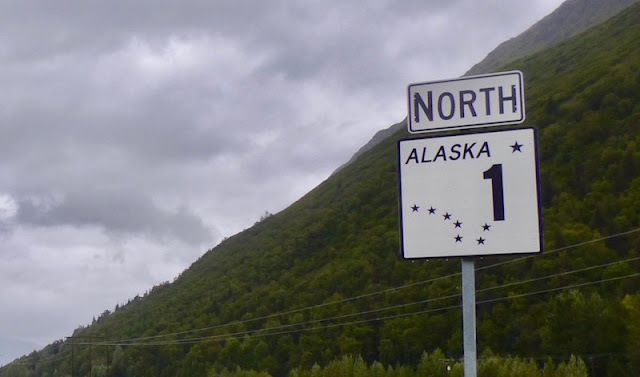 We continued along Turnagain Arm, passing through Anchorage and following Alaska Highway 1 until it intersects with Alaska Highway 3—also known as the Parks Highway—and continuing north on Highway 3. We ate lunch at Mountain High Pizza Pie before wandering through the open air market and visiting the various shops to browse the artwork, jewelry, clothing, and other offerings, many of which were locally made. 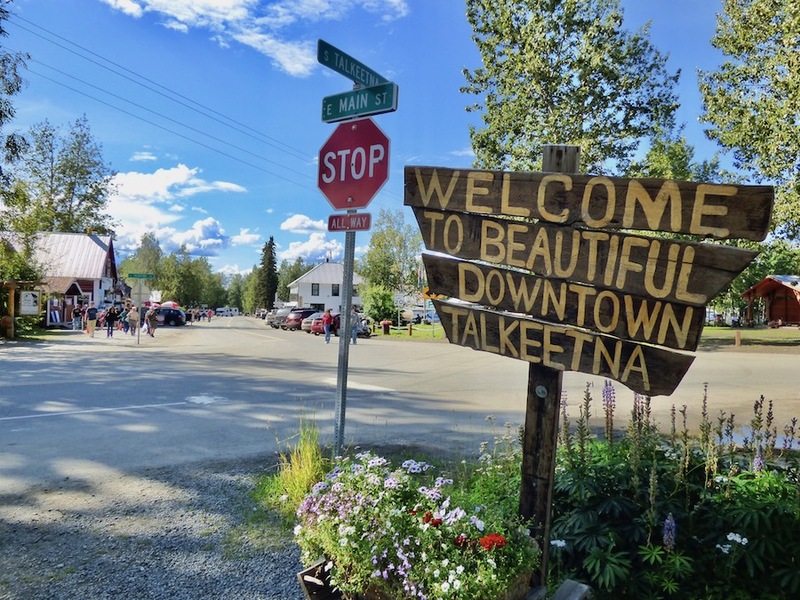 The weather was sunny and warm—a bit of a foreign concept for us since arriving in Alaska. A curious thing we kept hearing people in town say to each other was “The mountain is out.” “The mountain” is of course Denali (formerly known as Mt. McKinley...previously known as Denali), and “out” meant that it was not completely shrouded in clouds, which tends to be more its style. We would learn later that the mountain is not fully visible much of the time. Clear views are not the norm during most of the year, and more often than not the clouds hide most of the mountain, including its dual peaks, from view. It was clearly significant when the mountain could be seen. I may have actually said “whoa” like Keanu Reeves once I figured it out. What we were looking at was a layered vista of regular mountains, then clouds, then the snow-covered crags of a behemoth rising far above all of it. The majority of the mountain range was like a cute rock garden decorating Denali’s grounds. After that we drove on and on, stopping every so often to marvel at the scenery, which was stunning. We stopped at various scenic sites with expansive mountain views, as well as random spots along the road that caught our eyes. Fireweed was in bloom all around, its bright purple flowers popping against the lush green landscape. 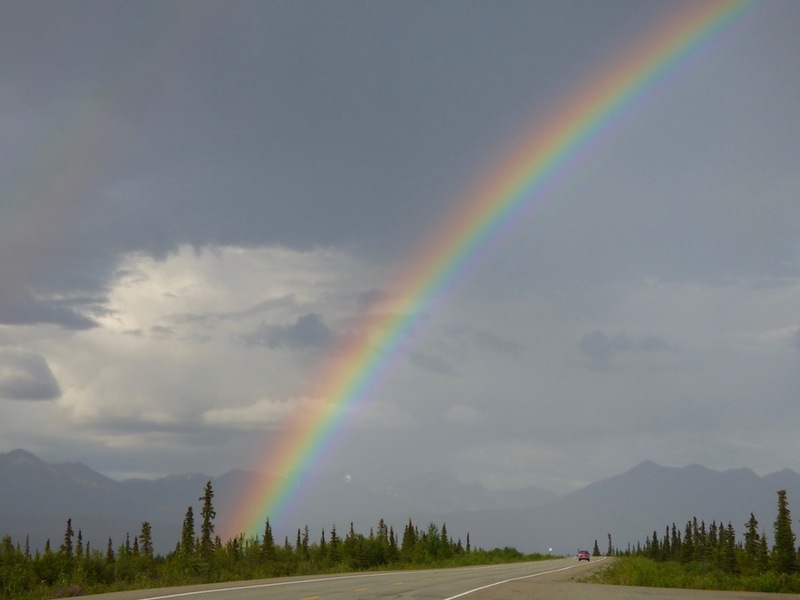 The most vivid rainbow either of us had ever seen appeared in front of us at some point, and it stayed there throughout the journey—sometimes obscured by clouds, but then re-appearing and guiding us forward like a beacon. The day was truly all sunshine and rainbows with one small exception: We discovered that the price of leaving the constant rain of Kenai Fjords behind was a growing abundance of mosquitoes the further north we drove. We had been lulled into a false sense of security by the lack of insects during the earlier part of the trip, and received a rude awakening when we were immediately assaulted by a mosquito armada upon getting out of the car at an interpretive site about the Alaska Range. In fact, I think it was that moment when it dawned on us that we hadn’t had to deal with mosquitoes at all and how awesome that had been. We were very quickly brought back to reality. Our destination for the night was Denali Lakeview Inn, a small B&B type place on Otto Lake in the town of Healy, about 10 miles north of the park. 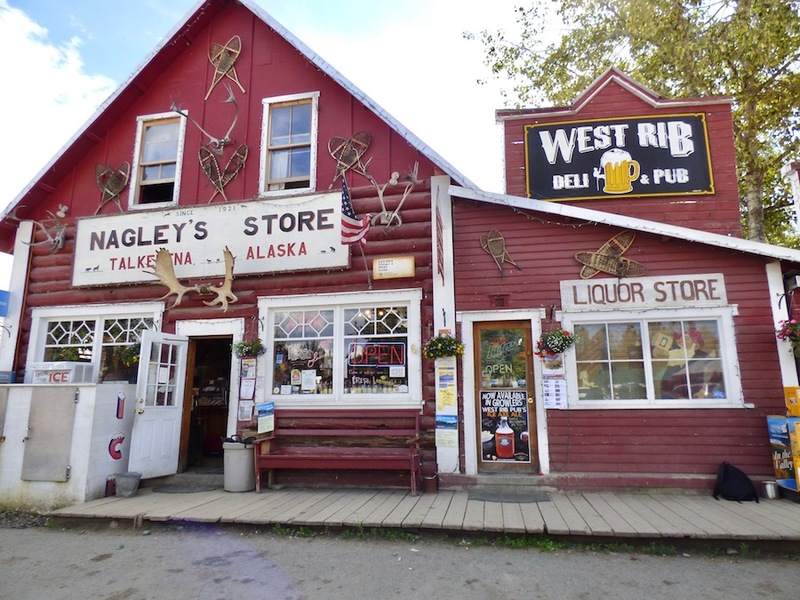 It’s an out-of-the-way establishment, located off a dirt road far from the busy area of the park, with a middle-of-nowhere feel to it. We arrived around 9:00 pm, located our welcome card on the wall outside near the entrance, and removed our shoes upon entering per the card’s instructions. We then made our way to our room and were immediately mesmerized by the view from our window. Otto Lake, Mount Healy, and the last remaining strip of our faithful rainbow gleamed before us, welcoming us to the rapture. Classical music twinkled from the clouds. There were mini boxes of cereal in the room. Everything was magical. It was difficult to leave, but we were hungry and decided to go to 49th State Brewing Company for a late dinner. Around 10:30 pm the sun was setting and the moon rose, full and orange above the mountains as we left the restaurant. We decided to drive to the park to familiarize ourselves with the location of the Wilderness Access Center, where we would need to be in the morning. We had an early start planned, and needed to be there at 6:30 am to board a shuttle. We drove to the park, stopping now and then to stare at the glowing moon on one side of the road and the colorful sunset on the other. 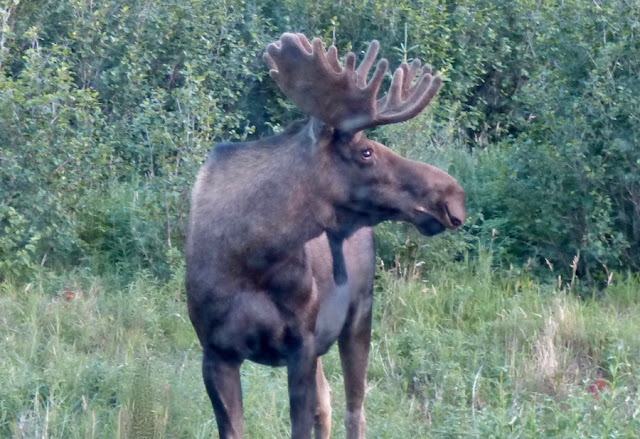 We encountered a couple of moose eating vegetation along the road during the dusky drive, and we pulled over a short distance away to watch them. After a few minutes, they seemed to become aware of our presence and began acting agitated, so we pulled away and left them to their roadside dining. We arrived at the park and did some reconnaissance. The weather was beautiful, and the clear sky offered perfect views of the moon, which had continued to become more orange and was looking magnificent. We hung around for a while, just loitering in a deserted parking lot and moon-watching. 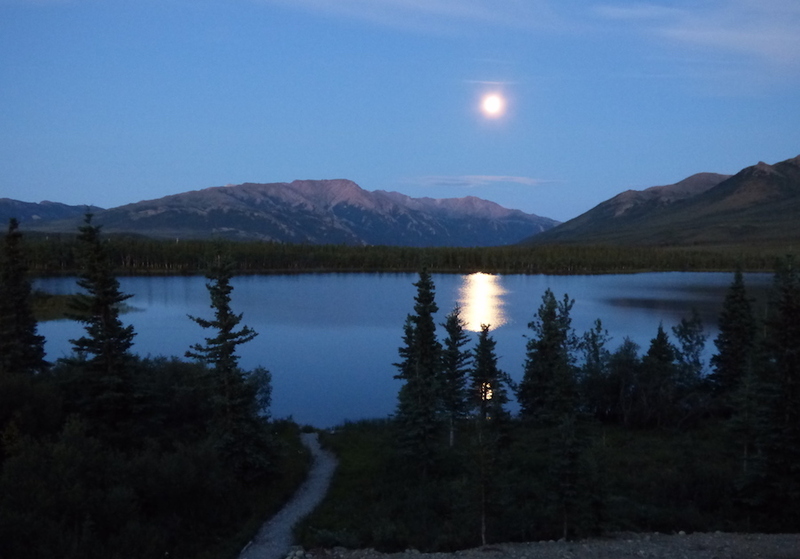 When we arrived back at the inn at midnight, the view over Otto Lake had transformed into a mystical blue dreamland. I was pretty sure that enlightenment could be reached in the reflection of the moon on the lake, and some kind of transcendental lullaby was emanating from the water itself. We didn’t want to go to sleep, but staying outside for more than a few minutes would’ve required a generous application of insect repellant to ward off mosquitoes, which we didn’t feel like getting into right before going to sleep. We reluctantly turned in and tried to get a few hours of sleep before attempting to see as much of Denali National Park as we could in a single day. Continued in Part Two: Eielson Visitor Center, Alpine Hike, and Lots and Lots of Grizzlies. Neat! 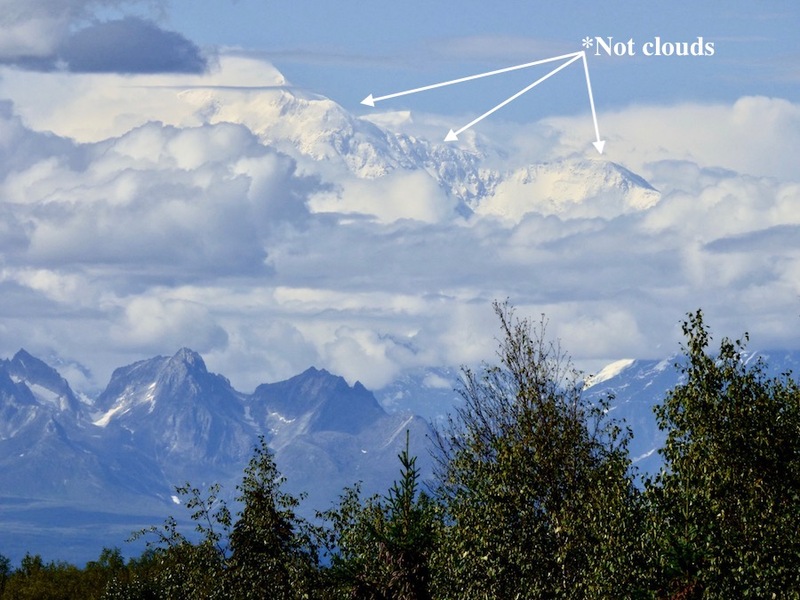 Love that Denali-in-the-clouds picture... totally unlike anything I normally see. Looking forward to the next part.